The citizens of Berlin will soon decide the historic airfield’s fate. The barbecue area or grillplatz at Tempelhof Airport in Berlin, Germany, does a brisk business. 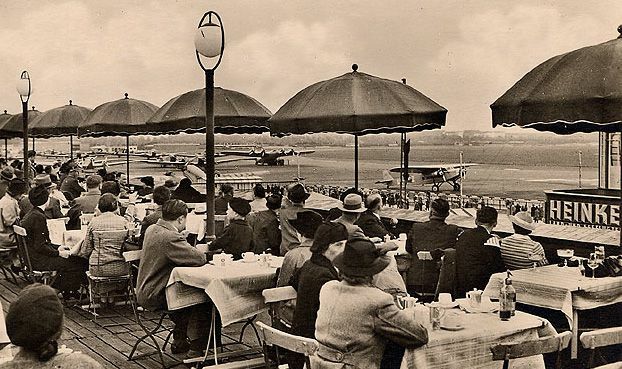 Since Tempelhof closed to air traffic in 2008, the grass between its abandoned runways has become the city’s best in wurst, along with being a popular spot for bicycling, jogging, and kite-flying. The runways at the historic site (first used by the Prussian military to launch balloons in 1884, and most famous to Americans for its role in the Berlin Airlift) are also tempting to commercial developers, who want a business park, and to politicians, who want affordable housing units and an immense library, which critics say is unnecessary and an eyesore. This spring the citizens of Berlin will get to decide Tempelhof’s fate. In January a petition with more than 233,000 signatures was submitted to force a referendum in the Berlin Senate, tentatively scheduled for the end of May. 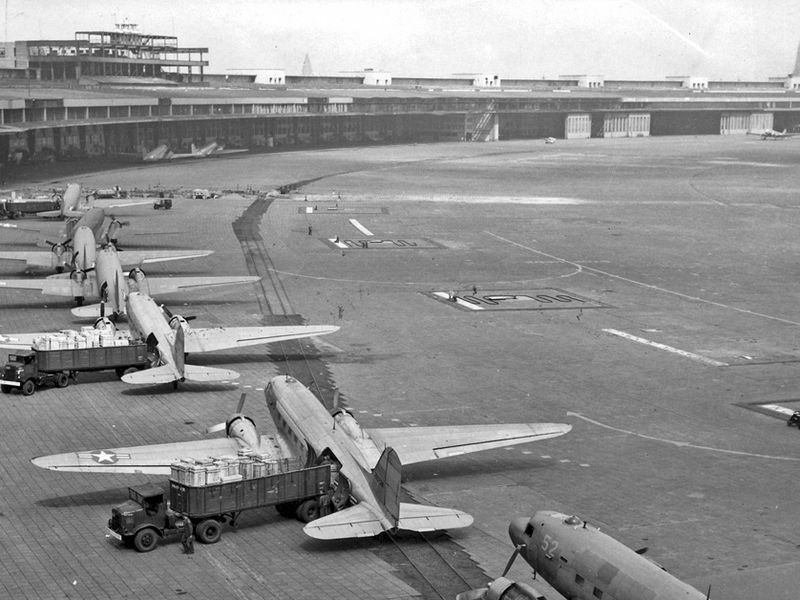 Some iconic reminders of Tempelhof’s history hang in the balance. On the apron near the abandoned main passenger terminal sits an American C-47 that participated in the Berlin Airlift of 1948-1949. 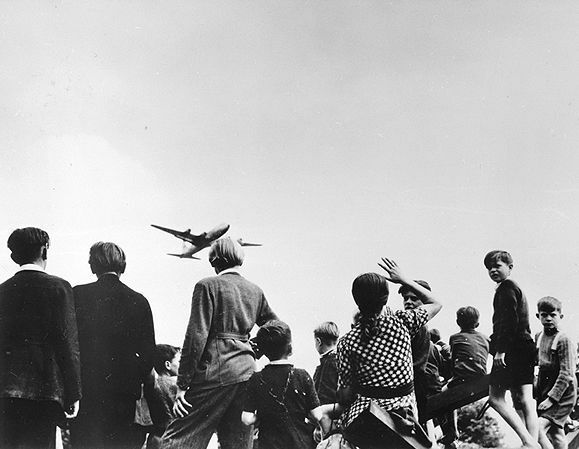 The Candy Bomber was flown by U.S. Air Force Lieutenant Gail Halvorsen to deliver a portion of the 2.3 million tons of supplies dropped during “Operation Vittles,” when Berlin was blockaded by the Soviets. The ramp is now host to lucrative exhibitions, such as the Bread and Butter fashion show that charged 500 euros ($685) per well-dressed head in January. If the business park and other development plans go through, signage from the runways, and even the twisted aircraft parts that currently form the backbone of a miniature golf course, may go under the bulldozer. 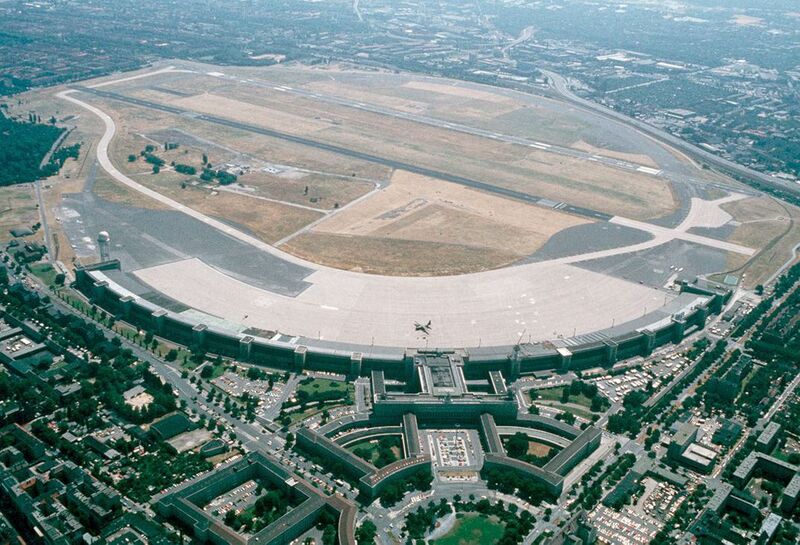 One of Tempelhof’s best known artifacts may also lose its nest. 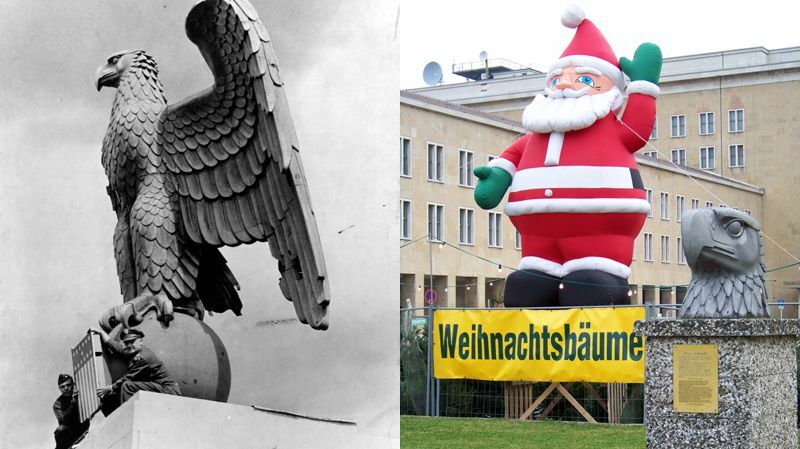 When the airport opened in 1934, the centerpiece of its Nazi architecture was a 14-foot Reichsadler, or imperial eagle, atop the main terminal building. The eagle was cast in iron, but was painted to look like bronze. 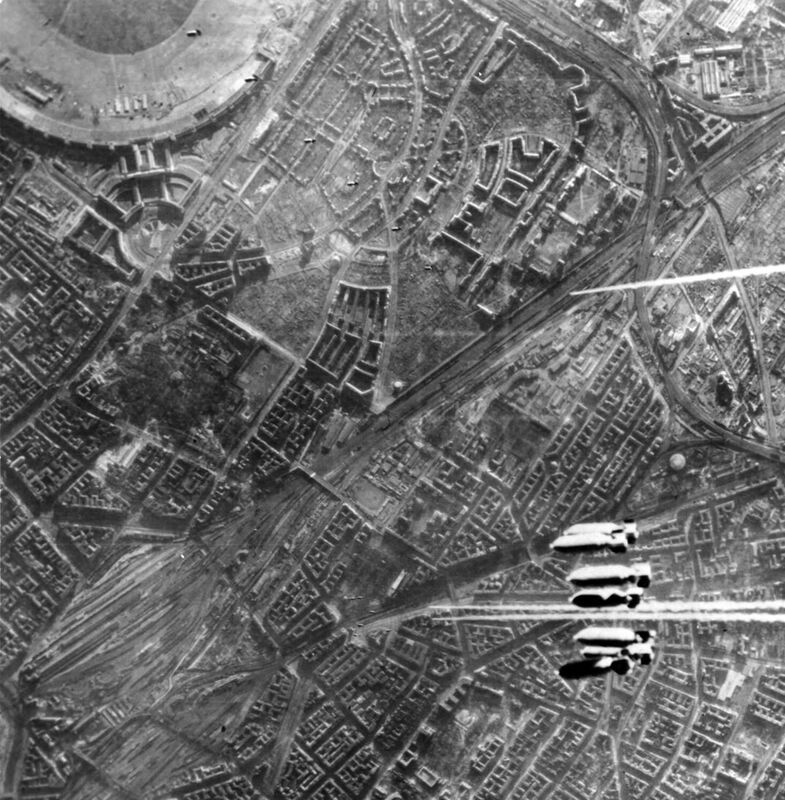 The Soviets occupied the airport in April of 1945, and that July ceded Tempelhof to the Americans, who covered the globe clutched by the eagle with a U.S. emblem and painted on a white haircut to resemble an American bald eagle. 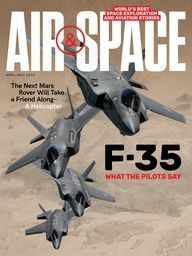 In 1962, when Tempelhof reopened to civilian passengers, the roof space was needed for radar, so the eagle’s head was lopped off as a prize for the military academy at West Point, New York, where it sat on display until 1985, before its return to Germany as a show of friendship.